If you have been considering purchasing the new Pi Top Raspberry Pi laptop kit that transforms your Pi mini PC into a fully fledge laptop, you might be interested to know that the kit will soon be available priced at $275 from Adafruit. The open source laptop allows you to build your very own Pi laptop and the kit supports the new Raspberry Pi 3 mini PC which launched just last month providing a considerable boost in performance when compared to older mini PCs in the Pi range. – Screen – Connect the screen by simply slotting the metal hinge into the base bottom piece. 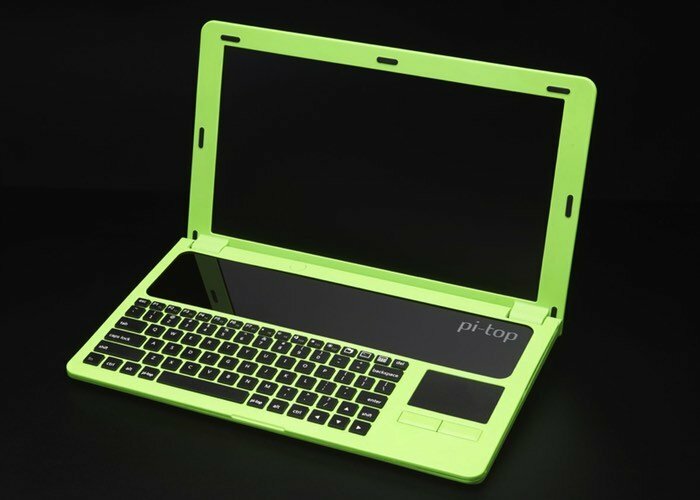 A single cable is plugged into the Pi-Top Hub and away you go! – Base Top – Attach and remove the base top piece by sliding it over the base bottom and pressing down. You will hear a satisfying ‘click’ when you have popped it into place. – Base Bottom – The base bottom contains the battery and modular rail where you will pop in the Hub and Raspberry Pi 2. No wires or tools are required, like a lego laptop you snap everything into place. The Pi-Top smart battery pack is protected by a sheet of brushed stainless steel, so you can be sure your battery is securely in place. For more information on the new Pi Top kit available from the Adafruit store jump over to the official Adafruit website for details.